J&A South Park's 25th Anniversary | Here's to 25 more! Cheers to 25 Years of Excellence . . .
Quite a lot happens in 25 years! Just think, you couldn’t take a “selfie” 25 years ago. Nor could you “Uber” a ride, “tweet” your opinion, “binge-watch” your favorite show on Netflix or store data on a “cloud” and so much more. has reached its 25th anniversary! As we celebrate, we say “Thank You” to all our customers and co-workers, both past and present. We like to think that J&A South Park’s 25 years of success can be attributed to a meticulous commitment to our core values: ethics, integrity and trust; our commitment to our employees and their families; and our service commitment to you, our customers. The company took flight in 1993 as the J&A Heating Company, when Baldwin, PA native and Gateway Technical Institute graduate Anthony Passatore had a vision to provide high quality heating services at an affordable price. The company grew as the needs of its customers increased, prompting Passatore to add plumbing services in 2000. Shortly after, he acquired South Park Heating & Plumbing, necessitating the name change to J&A South Park. In 2014, the company added an electrical services group to round out its service offering. 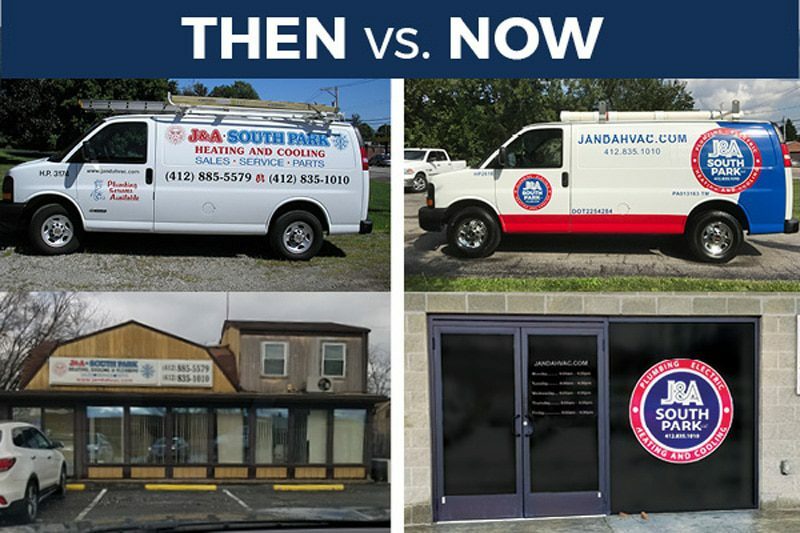 J&A South Park’s broad service offering now means that you deal with just one company – not three – to handle your HVAC, plumbing and electrical needs. “The industry has seen many changes in the last two and a half decades and we’re convinced our commitment to the highest technical skills and a focus on outstanding customer service has played a major role in us coming so far,” says Passatore. Today, sporting a fleet of 40 service vehicles, the company continues as the premier electrical, plumbing and HVAC service provider throughout Allegheny County and parts of Washington County. After 25 years, we are delighted to say that we now serve more homes in Western Pennsylvania than any similar service provider in the area. “We continue to offer our customers a team of certified and licensed trade professionals who share our promise to doing the job right the first time, every time,” asserts Anthony Passatore. Anthony Passatore has never lost sight of his roots and believes in giving back to the community that supports his company. Every year, the company plays an active role in sponsoring youth sports teams, as well as supporting a variety of other community events. As we move forward, we will renew our commitment to customer satisfaction, timely completion of work and quality of service and products. Cheers to J&A South Park’s 25 years, and here’s to the next 25!